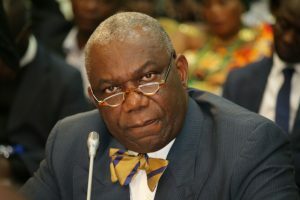 The Minister of Energy Mr. Boakye Agyarko has announced that government is working to ensure sustained availability of petroleum products at affordable prices. The move, according him is aimed at making fuel shortage a thing of the past as a reliable supply chain is established. Speaking at the maiden Energy Summit held yesterday in Accra, Mr. Agyarko also pointed out that government is worried over the increasing accidents in the sale of petroleum products hence has the ministry has developed an LPG Policy which will be published soon. “An LPG policy to address the disturbing safety challenges faced by the sector has been developed and is under discussion with key stakeholders before been finalized,” he announced. “We working to ensure sustained availability of petroleum products at affordable prices while minimizing hazards associated with the industry, especially in the usage and handling of LPG in the industry,” he added. Mr. Agyarko stated that issues of pricing and safety in the petroleum sector are key to the growth of the industry. He observed that it is important for the regulator to enforce the rules governing the sector to protect consumers and also ensure safety.